Emerich Kovacs III is an Electrical Engineering student, that started in Space Systems with a 16 month internship at Magellan in May of 2014, and is working there again this summer performing unit level hardware testing for RCM and providing engineering support for R&D projects. Aimee Carvey is a 4th year Mechanical Engineering student, specializing in aerospace. Last summer she had a four month work term at Magellan in the Space Department providing support to the Product Assurance team for the RCM project, and this summer is on a four month work term providing engineering support to the Defense Department. Magellan Aerospace is a global aerospace company that designs, engineers and manufactures aeroengine and aerostructure assemblies and components for aerospace markets, advanced products for military and space markets, industrial power generation, and specialty products. The Winnipeg operation was established in 1930 (formerly Bristol Aerospace) and became an operating division of Magellan Aerospace Corporation in 1997. The most recent addition to the Winnipeg division is the Advanced Satellite Integration Facility. The event will include a short presentation on Magellan Aerospace and the tour protocols, followed by tours of the various satellite testing and manufacturing facilities, including clean and vibe rooms, and an up close look at the 3 RCM (RADARSAT Constellation Mission) bus modules currently in production. Registration is required in advance, before May 15th, and limited to 20 people. Registrants must provide Citizenship and Employer information, and must bring photo ID for admittance to Magellan. Long pants and closed toed shoes are required for entry to the clean room. 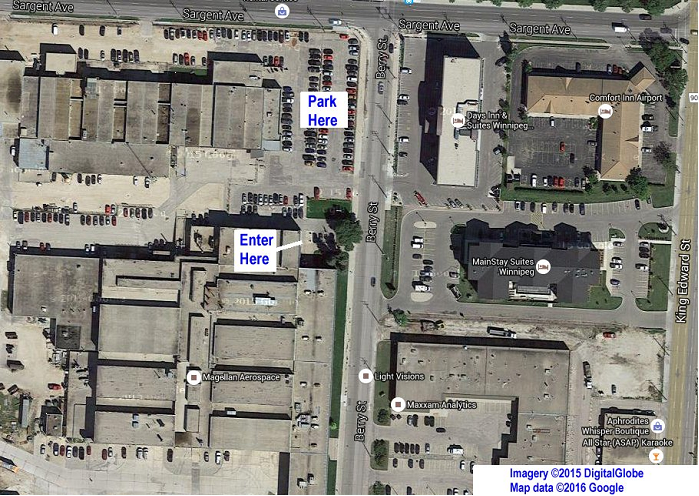 Parking is available in the north lot at the South West corner of Barry St. and Sargent Ave. The main entrance will be unlocked by security just prior to the event start time. See map below for details.